Senator Peris said in the Northern Territory an indigenous woman is 80 times more likely to be hospitalised for assault than other Territorians. “I shudder inside whenever I quote that fact because it makes me picture the battered and bloodied women we see far too often in our hospitals. LABOR’S first indigenous MP Nova Peris has challenged the Australian Medical Association to advocate for more action in tackling alcohol-related domestic violence. In a powerful speech, Senator Peris said alcohol-related domestic violence was on the rise and ruining the lives of Aboriginal women. She told the launch of the AMA’s national women’s health policy that the AMA must use its high standing in the community to “advocate for more action in tackling alcohol-related domestic violence”. “Today I call on the AMA to formally adopt a policy position that supports the principle that people who have committed alcohol-related domestic violence be banned from purchasing alcohol at the point of sale. In 2013, domestic violence assaults increased in the Northern Territory by 22 per cent, she said. She criticised the incoming NT government’s August 2012 decision to scrapped the banned drinker register. “For those of you who may not be familiar with the banned drinker register, or BDR as it is also known, it was an electronic identification system which was rolled out across the Northern Territory. “This system prevented anyone with court-ordered bans from purchasing takeaway alcohol — including people with a history of domestic violence. Senator Peris said she had met with doctors, nurses and staff from the emergency department in Alice Springs and they confirmed these statistics represent the true predicament they faced every day. She said the Northern Territory faces enormous issues with foetal alcohol spectrum disorder. “We have such high rates of sexually transmitted infections, especially and tragically, with children. Senator Peris’s speech was well received by the AMA, which committed to taking on her challenge. The AMA today released the updated AMA Position Statement on Women’s Health. 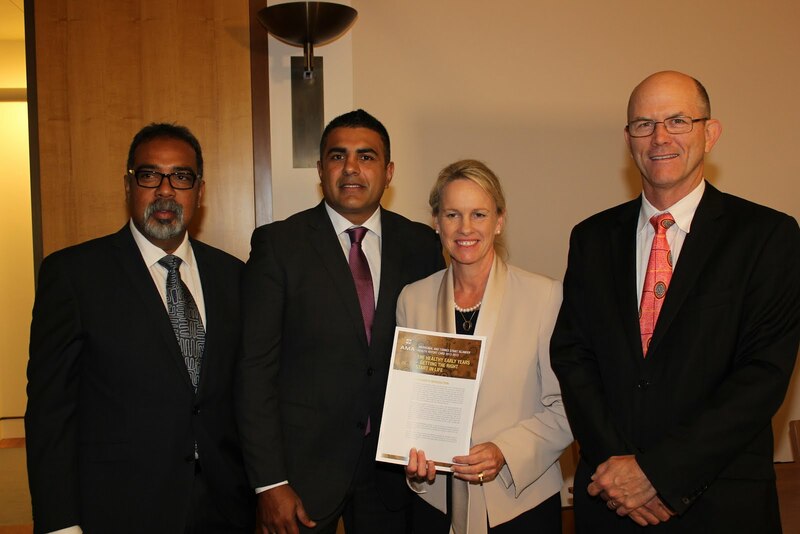 The Position Statement was launched at Parliament House in Canberra by the Minister Assisting the Prime Minister for Women, Senator Michaelia Cash, Senator for the Northern Territory, Nova Peris, and AMA President, Dr Steve Hambleton. Dr Hambleton said that all women have the right to the highest attainable standard of physical and mental health. “The AMA has always placed a high priority on women’s health, and this is reflected in the breadth and diversity of our Position Statement,” Dr Hambleton said. “We examine biological, social and cultural factors, along with socioeconomic circumstances and other determinants of health, exposure to health risks, access to health information and health services, and health outcomes. “And we shine a light on contemporary and controversial issues in women’s health. “There is a focus on violence against women, including through domestic and family violence and sexual assault. “These are significant public health issues that have serious and long-lasting detrimental consequences for women’s health. “It is estimated that more than half of Australian women have experienced some form of physical or sexual violence in their lifetimes. “The AMA wants all Australian governments to work together on a coordinated, effective, and appropriately resourced national approach to prevent violence against women. “We need a system that provides accessible health service pathways and support for women and their families who become victims of violence. Dr Hambleton said the updated AMA Position Statement also highlights areas of women’s health that are seriously under-addressed. “This includes improving the health outcomes for disadvantaged groups of women, including Aboriginal and Torres Strait Islander women, rural women, single mothers, and women from refugee and culturally and linguistically diverse backgrounds,” Dr Hambleton said. Dr Hambleton said that the AMA recognises the important work of Australian governments over many years to raise the national importance of women’s health, including the National Women’s Health Policy. “There has been ground-breaking policy in recent decades, but much more needs to be done if we are to achieve high quality equitable health care that serves the diverse needs of Australian women,” Dr Hambleton said. “Although women as a group have a higher life expectancy than men, they experience a higher burden of chronic disease and tend to live more years with a disability.  health research, data collection and program evaluation. in general, women report more episodes of ill health, consult medical practitioners and other health professionals more frequently, and take medication more often than men. It appears that stationing police officers outside bottle shops in regional towns in the Northern Territory has had a significant impact on alcohol consumption. The latest figures show consumption has dropped to the lowest level on record, but the statistics do not include the impact of the mandatory rehabilitation policy or punitive protection orders. The ABC has investigated the situation as a new federal parliamentary inquiry is promising to test the evidence. On a weeknight in Darwin’s city centre, locals and tourists mingle at Monsoons, one of the pub precinct’s busy watering holes. Less than a block away, six women have found their own drinking place under the entrance of an office building, sheltered from monsoonal rain. Most of them are visiting from Indigenous communities on Groote Eylandt in the Gulf of Carpentaria. They’re “long-grassing” – living rough on the city streets. Northern Territory Labor Senator Nova Peris is here to talk to them. One of the women, from the Torres Strait Islands, tells the Senator how she is trying to get through a catering course while struggling with homelessness and alcoholism. “I am doing it. I’m trying to get up and I’m finding it hard,” she said. In an interview after talking to the “long-grassers”, Senator Peris emphasised how homelessness makes alcohol abuse among Aboriginal people more obvious than alcohol use in the non-Indigenous community in Darwin. Senator Peris also blames alcohol abuse for much of the poor health in Aboriginal communities. “When you look at alcohol-related violence, when you look at foetal alcohol syndrome, when you look at all the chronic diseases, it goes back to the one thing and it’s commonly known as the ‘white man’s poison’,” she said. The Northern Territory has long grappled with the highest levels of alcohol abuse in the country, but figures released recently by the Northern Territory Government show the estimated per capita consumption of pure alcohol dropped below 13 litres last financial year for the first time since records started in the 1990s. Territory Country Liberals Chief Minister Adam Giles believes a more targeted response by police has made a difference. But Senator Peris says data released last week tells a different story. Senator Peris has quoted figures showing an 80 per cent increase in alcohol-related hospital admissions over the past 14 months as evidence that the previous Labor government’s banned drinker register was working. 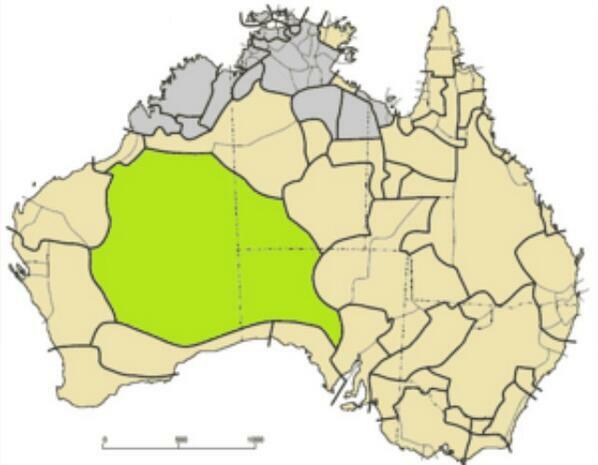 The Territory Government scrapped the BDR when it won power in September 2012. Alice Springs-based associate professor John Boffa from the Peoples Alcohol Action Coalition wants to see the consumption figures verified. “If it’s true, it’s very welcome news and it would reflect the success of the police presence on all of the takeaway outlets across the territory,” he said. In regional towns where alcohol-fuelled violence is high, police have been stationed outside bottle shops to check identification. Anyone living in one of the many Aboriginal communities or town camps where drinking is banned faces the prospect of having their takeaway alcohol seized and tipped out. Northern Territory Police Association president Vince Kelly believes police resources are being concentrated on doing the alcohol industry’s work. Mr Kelly has also questioned the will of the two major political parties to introduce long-term alcohol supply reduction measures since it was revealed that the Australian Hotels Association made $150,000 donations in the lead-up to the last Territory election. “No-one I know gives away $150,000 to someone and doesn’t expect something back in return,” he said. But Mr Giles dismisses Mr Kelly’s view. “I don’t respond to any comment by Vince Kelly from the Police Association, I think that he plays politics rather than trying to provide a positive outcome to change people’s lives in the territory,” he said. The Federal Indigenous Affairs Minister has asked a parliamentary committee to investigate the harmful use of alcohol in Indigenous communities across the country. The committee is expected to examine the application of new policies in the Territory, including mandatory alcohol treatment that was introduced in July 2013. People taken into police protective custody more than three times in two months can be ordered to go through a mandatory three-month alcohol rehabilitation program. The figures showing a drop in consumption pre-date the introduction of mandatory rehabilitation but Mr Giles believes the policy is making a difference. So far there is not enough evidence to convince Professor Boffa that mandatory treatment is making any difference. “We just don’t have publically available data on the numbers of people who have completed treatment, [or] how long people who have completed treatment have remained off alcohol,” he said. One of the women from Groote Eylandt explained how she had been locked up to go through the mandatory treatment program but was now back on the grog. “I was there for three months and we didn’t like it,” he said. The Chief Minister’s political stablemate, Indigenous Affairs Minister Nigel Scullion, has commended the Territory Government for using a mix of police intervention and mandatory rehabilitation, but says jail is not the solution. “We can’t keep treating people who are sick as criminals. However annoying they might be, people who are alcoholics are ill,” he said. Police were given the power to issue Alcohol Protection Orders to anyone arrested for an alcohol-related offence, attracting a jail sentence of six months or more. Aboriginal legal aid services have criticised the orders for criminalising alcoholism. Priscilla Collins from the North Australian Aboriginal Justice Agency says the orders are predominantly being handed out to Aboriginal people, threatening jail time if they are breached. “Alcohol protection orders are really being issued out like lolly paper out on the streets. You can be issued one just for drinking on the street, for drink driving. We’ve already had 500 handed out this year,” she said. Mr Kelly has welcomed the introduction of APOs as a useful tool but has questioned what they will achieve. “The community and the Government and everybody else needs to ask itself what the end game is,” he said. 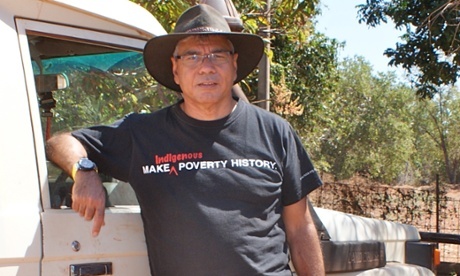 Warren Mundine tell us about yourself. I was born in Grafton in Northern NSW and moved to Auburn in Western Sydney when I was seven years old. I’m from the Bundjalung, Gumbaynggir and Yuin people. My father’s family come from Baryulgil about 80 km north of Grafton, on the Clarence River. He grew up there and moved when he married my mother. I was one of 11 children and I slept in a single bed with three of my brothers until I was about 12 – which was fine except that my youngest brother wet the bed. My first name “Nyunggai” means “sun”. It was the skin name that my father gave to me as a child. Recently I changed my name by deed poll to Nyunggai Warren Mundine and so now I use it officially. My parents worked and sent us to Catholic schools. God, work and school were very important in our family. Even so, as a teenager I started to drift and my reading and writing didn’t progress past primary level. I caused my parents a lot of trouble getting into fights, consuming alcohol and drugs, etc. At one point I was arrested and detained as a juvenile. My parents, a priest and a local white couple stood up for me in court and I was given another chance. They kept an eye on me, I got a labouring job and finished school at TAFE. I stayed in labouring and trade jobs for about 10 years. My first office job was as a clerk at the Tax Office. I lived in Armidale and Dubbo when my kids were young and got elected to Dubbo Council where I was deputy mayor. That’s how I got involved in the Labor party, and eventually I was elected its national president. I spent about nine years as CEO of NTSCorp, working with NSW Aboriginal communities on their native title, and I was CEO of GenerationOne in 2013. I now run my own business and have been appointed to advise the prime minister on Indigenous issues as chair of the Indigenous Advisory Council. I’m married to Elizabeth and between us we have 10 children (most are grown up). It’s a lot of fun. And of course, I am a mad lover of football. What do you plan to talk about on @IndigenousX this week? This week I wrote a blog post which I called The First Tree. It’s about how we address seemingly insurmountable problems. People laugh at on me on Twitter for having simple suggestions – like getting kids to school – and focusing on practical things. But I don’t think theorising and admiring a problem from every angle achieves much. Sometimes simple things are what leads to the biggest changes, most quickly. So I will be focussing on the “bread and butter” issues for closing the gap – jobs, education, school attendance, health, welfare – and I want to prompt some discussion on our traditional nations and cultures and what they have to offer us. As always I want to prompt conversations which make people think, and where readers are prepared to challenge their own thinking. What issue(s) affecting Indigenous peoples do you think is most pressing? If you read my articles, speeches and blogs you will get a good idea of where I think the priorities are. School attendance, welfare to work and incarceration, particularly juvenile detention, are big ones. And for communities – social stability, economic and commercial development, land ownership. The high suicide rates amongst Indigenous people is a devastating problem. I’ve been reading and talking to people over the last few months in particular so as to understand it better. It’s not a topic that is easy to discuss on a medium like Twitter, however. My father, Roy Mundine, and mother Dolly Mundine (née Donovan) were big role models in my life. Apart from them, my greatest role model was Lionel Rose, world champion boxer. He was a 19 year old Aboriginal boy from Jackson Flats, and he won the world title. He showed me that the world can be your oyster if you are willing to focus and work hard. Also Charles Perkins and John Moriarty who both overcame adversity, went to university when it wasn’t easy for Aboriginal people to do that – both played football, and John was selected for the national team. This year my hope is that all Indigenous kids are going to school every school day, and that state and territory governments bring in mandatory diversionary programs for juvenile offenders into jobs and education. I’ve outlined my long term hopes in a number of my articles and speeches, particularly the Garma Speech and my recent Australia Day address. In the end, my hope is that Indigenous people can be full participants in Australian life and all it has to offer as well as being part of strong and thriving traditional nations where they can take care of their culture, language, traditional lands and build an economic future. Cancer in Aboriginal and Torres Strait Islander peoples of Australia: an overview is one of a series of reports commissioned by Cancer Australia and developed in collaboration with the Australian Institute of Health and Welfare.
. 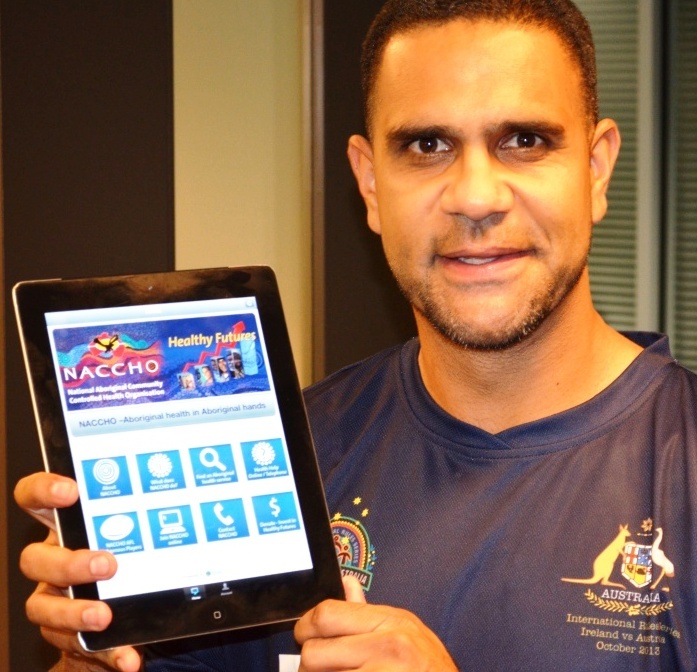 It aims to document key cancer statistics to inform health professionals, policy makers, health planners, educators, researchers and the broader public of relevant data to understand and work towards reducing the impact of cancer for Indigenous Australians. On average, per day, around two Aboriginal and Torres Strait Islander people are diagnosed with cancer and there is just over one cancer-related death. Importantly, this report identifies significant differences between Indigenous Australians and their non-Indigenous counterparts. While incidence rates for cancer overall were marginally higher for Indigenous peoples, mortality and survival differences between the two population groups were more marked with cancer mortality rates 1.5 times higher and survival percentages 1.3 times lower for Aboriginal and Torres Strait Islander peoples. This report also looks at the 10 most commonly diagnosed cancers as well as the 10 most commonly reported causes of cancer deaths for Aboriginal and Torres Strait Islander peoples of Australia, accounting for over 60% of cancers in these groups. Lung cancer was both the most commonly diagnosed cancer and the leading cause of cancer deaths for this population group. Differences between gender and across age groups are also identified. In a recent interview on ABC’s , Mark Colvin discussed findings from the Australian Institute of Health and Cancer Australia which indicates that Indigenous people are 50 per cent more likely to die from cancer than other Australians. MARK COLVIN: It may be the most deadly reality of closing the gap: Indigenous people are 50 per cent more likely to die from cancer than other Australians. And that’s just one of the shocking findings contained in a new report from the Australian Institute of Health and Welfare and Cancer Australia. It’s the first comprehensive investigation into increased cancer rates among Indigenous Australians. MANDIE SAMI: Cancer in Aboriginal and Torres Strait Islander Peoples of Australia: An Overview is the first comprehensive summary of cancer statistics for Indigenous Australians. The head of the Australian Institute of Health and Welfare’s cancer and screening unit, Justin Harvey, says the report reveals disturbing facts. JUSTIN HARVEY: Indigenous Australians are approximately 50 per cent more likely to die from cancer than non-Indigenous Australians and that’s quite a big difference between the two. The rate of new cases for Indigenous Australians is also higher and survival from cancer is poorer. MANDIE SAMI: Kristin Carson is the chair of the Indigenous Lung Health working party for the Thoracic Society of Australia and New Zealand. She says it’s sad that she’s not shocked by the findings. KRISTIN CARSON: This is something that has been going on for such a long time. I mean, we know that there is a disparity in health between Indigenous and non-Indigenous Australians. It’s actually atrocious. A lot of Aboriginal and Torres Strait Islander Australians who see this probably already know it. They live this. This is the reality and I guess it’s these types of more shocking statistics that bring the kind of problems that we’re having to light. MANDIE SAMI: The CEO of Cancer Australia, Professor Helen Zorbas, says there are a number of reasons why there’s such a huge discrepancy between Indigenous and non-Indigenous Australians. HELEN ZORBAS: Those factors definitely include tobacco smoking, alcohol consumption, poor diet, lower levels of physical activity and higher levels of infections such as hepatitis B. In addition to that, Indigenous peoples are less likely to participate in screening programs. Also, the proportion of Indigenous people who live in regional and rural and remote areas is higher than for non-Indigenous people and therefore access to care and services – we have a higher proportion of Indigenous people who discontinue treatment. MANDIE SAMI: The head of the Institute’s cancer and screening unit, Justin Harvey, says even the types of cancer most prevalent among Indigenous Australians are different. JUSTIN HARVEY: In terms of the most commonly diagnosed cancers for Indigenous Australians, these were lung cancer, followed by breast cancer in females and bowel cancer. Whereas for non-Indigenous Australians, the most commonly diagnosed were prostate cancer, followed by bowel cancer and breast cancer in females. MANDIE SAMI: Mr Harvey says the report shows there needs to be more health promotion campaigns and services targeting Indigenous Australians. JUSTIN HARVEY: The most important thing is that the information is used in looking at what are the needs and how best to address those needs. MANDIE SAMI: That call has been backed by Kristin Carson. She says there’s also a need to evaluate whether current campaigns like these are working. ACTOR, ANTI-SMOKING AD: I was smoking but I quit. If I can do it, I reckon we all can. ACTOR 2, ANTI-SMOKING AD: Not quitting is harder. MANDIE SAMI: Ms Carson says all Australians have a moral obligation to ensure that improving the health of Indigenous Australians is a national priority. KRISTIN CARSON: Talk with community members, find out what we should be doing, and again, it highlights that we really need to be looking at research or evaluations in this area to try and better address this problem. MANDIE SAMI: Associate Professor Gail Garvey is a senior researcher in cancer and Aboriginal and Torres Strait Islander Health at the Menzies School of Health. She hopes the findings will make policymakers realise the devastating effect cancer is having on Indigenous populations. GAIL GARVEY: Other areas, you know, such as cardiovascular disease, diabetes, kidney disease, which are all very important in their own right, tend to get the sort of focus, where cancer has just been sort of creeping behind all the other illnesses and diseases thus far. So I think this report will give us a chance and give governments and health professionals and communities an opportunity now to actually look at what’s happening, you know, in black and white in this report, what’s happening nationally. And hopefully we can do something more about it than what’s currently being done. 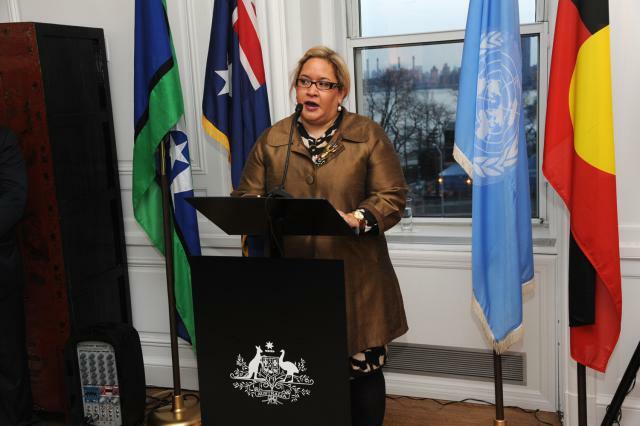 Lisa Jackson Pulver holds the Inaugural Chair of Indigenous Health and is a Professor of Public Health at UNSW. View her full profile here. The media loves a bad news story – and the response to the latest report on Aboriginal and Torres Strait Islander health is no exception. The Sydney Morning Herald called the past 10 years a “wasted decade“, highlighting increasing rates of diabetes, kidney disease, asthma and osteoporosis among Indigenous people, along with the 11-year gap in life expectancy between Indigenous and non-Indigenous Australians. But the largest-ever survey of Aboriginal and Torres Strait Islander health released by the Australian Bureau of Statistics also has some good news to report that was all too easily passed over. 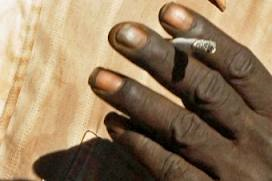 Fewer Indigenous people are taking up smoking, and those who do smoke are giving up the habit. This is despite nicotine being an addictive substance, highly influenced by social norms. For years, smoking rates have been much higher in the Indigenous community than in the non-Indigenous community. But according to the Bureau, the proportion of young Aboriginal and Torres Strait Islander people aged 15 to 17 years who have never smoked has increased from 61 per cent to 77 per cent, with an increase from 34 per cent to 43 per cent for those aged 18 to 24 years. This result is matched by the non-Indigenous community. It should be applauded and recognised by all Australians: it shows the resilience of our young people who are increasingly saying no to smoking. The choice they are making will mean a decrease in the knock-on effects that chronic smoking brings. While it must be acknowledged that this is only one indicator of success, it is still a win. So, where are the accolades for all the tobacco control programs, the Aboriginal Health Worker mentors and those with the resolve to never smoke or to stop? Why is this not the story? Among the findings in the ABS report, Indigenous Australians are reported as being more than three times as likely as non-Indigenous Australians to have diabetes. While this is cause for concern, many of the major health problems for Indigenous communities are not only affected by health spending, but by the wider determinants of health. This means it will take much longer before we see viable gains. So it should come as no surprise that in such a short period, since 2009, the Closing the Gap policy framework and funding did not produce positive health outcomes on all measures. The period surveyed (2012-2013) cannot have benefitted from the new money that flowed as a result of Closing the Gap. It is too early. More importantly, the severe disadvantage many of these data reflect reinforces the argument for concerted action and sustained funding over the longer term. We must also remember that early prevention and intervention is important, so we need to continue to look for the early and intermediate signs of what will become a long-term improvement in health – which of course includes lower smoking rates, a top risk factor for a wide array of other health conditions. Likewise, we should not simply focus on the current rates of chronic disease, but also the factors that contribute to good health in the future: nutritional status and healthy diets, physical activity, access to antenatal care, not smoking, engagement in family and community activities, housing quality and whether there is overcrowding, employment and cultural and psychological wellbeing – all of which lay the foundations to health. Aboriginal and Torres Strait Islander health, like everyone’s health, is much more than the absence of disease. It involves physical, social, emotional, cultural, spiritual and ecological wellbeing and fulfilment of potential to contribute to the wellbeing of the whole community. Looking more deeply, we can see the outstanding successes in Aboriginal and Torres Strait Islander primary healthcare services, visual and performing arts, drama, music, tertiary education and sport as examples of early indicators that many people are flourishing. It is very easy to see only the negative, given the statistics that seem to bombard us. That’s unfortunate because it promotes a sense of hopelessness, when what is needed is energy, positive models of change and positive commitment over the long term. There would be great value in capturing these positive changes, in collecting and amplifying the voices of those young people in particular who have made conscious decisions to live well and let these voices join the growing chorus of role models, exemplars and successful ventures in our communities. Closing the Gap is a great start – and a much needed catalyst for change – but it is necessary to shift the lens towards the kinds of deeper changes that lead to lifelong health, including not smoking. Instead of focusing on the negatives, why not support those effective, community-driven enterprises and programs already having positive impacts, so that the children of our children will again enjoy the great opportunities that life in this magnificent country has to offer. There are some incredible things happening out there in communities all around Australia. Our Report Card shines a bright light on what needs to be done to improve the health and wellbeing of Aboriginal and Torres Strait Islander children in their important early years of life. Unfortunately there’s nothing new about inter-generational Indigenous disadvantage. But Australian Medical Association national president Steve Hambleton says new developments in neuroscience, molecular biology and epigenetics provide a scientific explanation for the cycle of disadvantage. 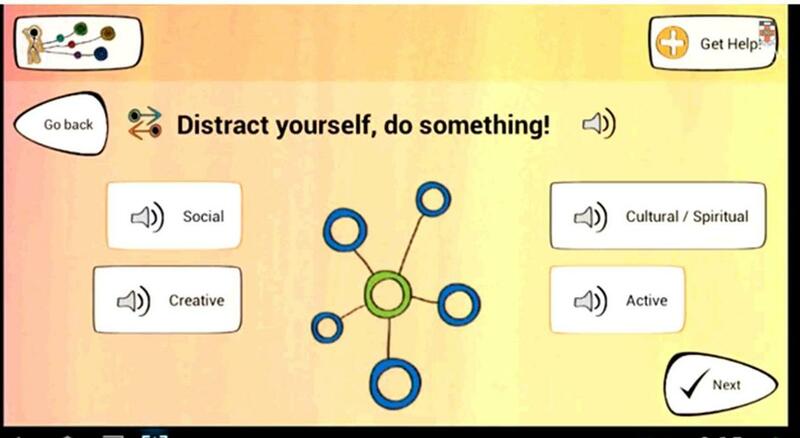 The AMA report says repetitive stressful experiences early in life can cause changes in the function of genes that influence how well the body copes with adversity throughout life – including the development of emotional control, memory function and cognition. The report cites research showing more than 20 per cent of Aboriginal and Torres Strait Islander families with children under 16 experience seven or more life stress events in a year. 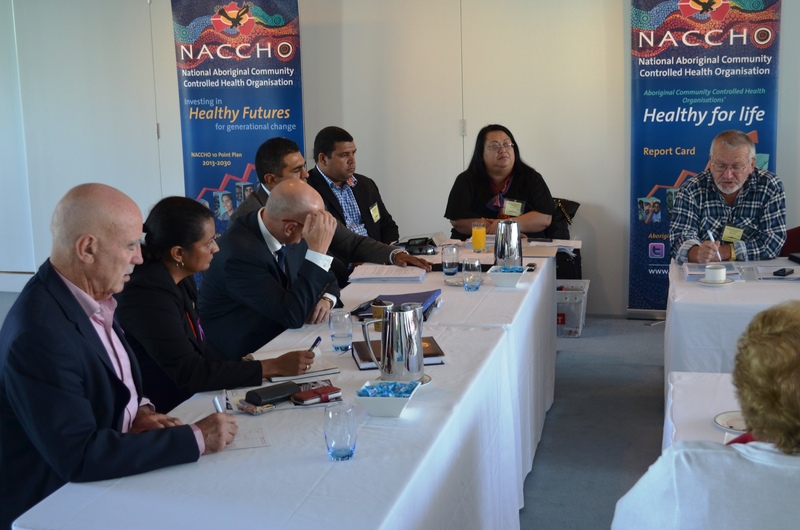 Chairman of the National Aboriginal Community Controlled Health Organisation, Justin Mohamed, admits it’s daunting to think about the impact early childhood events can have on a genetic level. Mr Mohamed says in many ways the science backs up what’s long been known. But he hopes the evidence will help focus efforts and investment on the early years – the years he says really change lives. The Australian Indigenous Doctors’ Association chief executive officer, Romlie Mokak, says the report also highlights the importance of providing support to mothers- and fathers-to-be. Recommendations from the AMA report include establishing a national plan for expanded maternal and child services including parenting and life skills education, expanding home visit services and building a strong sense of cultural identity and self-worth. Mr Mokak acknowledges the report is just one of thousands written in an attempt to address Indigenous disadvantage. But he hopes this one will receive the bipartisan support and funding needed to capitalise on its findings. The AMA Indigenous Health Report Card is one of the most significant pieces of work produced by the AMA. It gives us great pride. It matters. It makes a difference. We have been producing these Report Cards for over a decade now, and each time we focus on a different aspect of Indigenous health – children’s health, primary care, funding, men’s health, or inequity of access. We come at it from all angles. We do not pretend to have all the solutions to the many health problems that confront Aboriginal peoples and Torres Strait Islanders. But the AMA recognises and acknowledges the problems and we want to help fix them. Our Report Cards are a catalyst for thinking, and hopefully a catalyst for action. This year we are focusing on the early years of life. It is the right of every Australian child to have the best start in life – but in Australia today not every child benefits from this right. In their early years, children need to be safe, have adequate opportunities for growth and development, and have access to adequate health, child development, and education services. Many of our children are missing out, but none more so than Aboriginal and Torres Strait Islander children. There have been some improvements in recent years with many Aboriginal and Torres Strait Islander children making a successful transition to healthy adult life. But there are still far too many who are being raised in community and family environments that are marked by severe early childhood adversity. This adversity in early life can affect educational and social functioning in later life, and can increase the risk of chronic illness. We are seeing improvements through government commitment and cooperation on closing the gap initiatives, but much more action is needed. Epigenetics is all about how early life experiences become hard-wired into the body, with life-long effects on health and wellbeing. Early experiences can influence which of a person’s genes are activated and de-activated and, consequently, how the brain and the body develop. Building and providing stable and healthy life experiences in the early years can help break the cycle of adversity. That is our task and our challenge. Good nutrition, responsive care and psychosocial stimulation can have powerful protective benefits to improve longer-term health and wellbeing. Strong culture and strong identity are also central to healthy early development. The costs to individuals, families, and society of Aboriginal and Torres Strait Islander children failing to reach their developmental potential continue to be substantial. Robust and properly targeted and sustained investment in healthy early childhood development is one of the keys to breaking the cycle of ill health and premature death among Aboriginal peoples and Torres Strait Islanders. It is crucial for the momentum to be sustained by renewing the COAG National Partnership Agreements on Indigenous Health and on Indigenous Early Childhood Development for another five years. Building a strong sense of cultural identity and self-worth; improving the living environment with better housing, clean water, sanitation facilities, and conditions that contribute to safe and healthy living; and better data, research and evaluation culturally appropriate measures of early childhood development and wellbeing. We have also highlighted some examples of programs that are already being successful at improving the early years of Indigenous children. There is the Darwin Midwifery Group Practice, the Aboriginal Family Birthing Program in South Australia, and the NSW Intensive Family Support Service are just a few. Our governments – individually and through COAG – must examine these programs, learn from them, and replicate them where possible. Our governments must also look at the Abecedarian approach to early childhood development. This involves a suite of high quality teaching and learning strategies to improve later life outcomes for children from at-risk and under-resourced families. It is being used to great effect at the Central Australian Aboriginal Congress in Alice Springs. The AMA believes the Abecedarian approach has a strong track record of success and we urge all governments to have a closer look for possible widespread implementation. It also brings together some of the great work that is already happening to make a difference. Importantly, it defines a challenge for all of us – governments, the medical profession, the r health and education sectors, and the broader community – to give these kids and their families a healthier life. 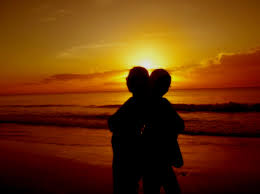 Aboriginal women remain twice as likely to die in childbirth as non-Aboriginal mothers, and are significantly more likely to experience pregnancy complications and stressful life events and social problems during pregnancy, such as the death of a family member, housing problems, and family violence [Brown, 2011];around half of Aboriginal and Torres Strait islander mothers who gave birth in 2010 smoked during pregnancy, almost four times the rate of other Australian mothers; and while infant mortality continues to fall, low birth weight appears to be increasing. Aboriginal and Torres Strait Islander children are twice as likely to die before the age of five than other Australian children of that age group. 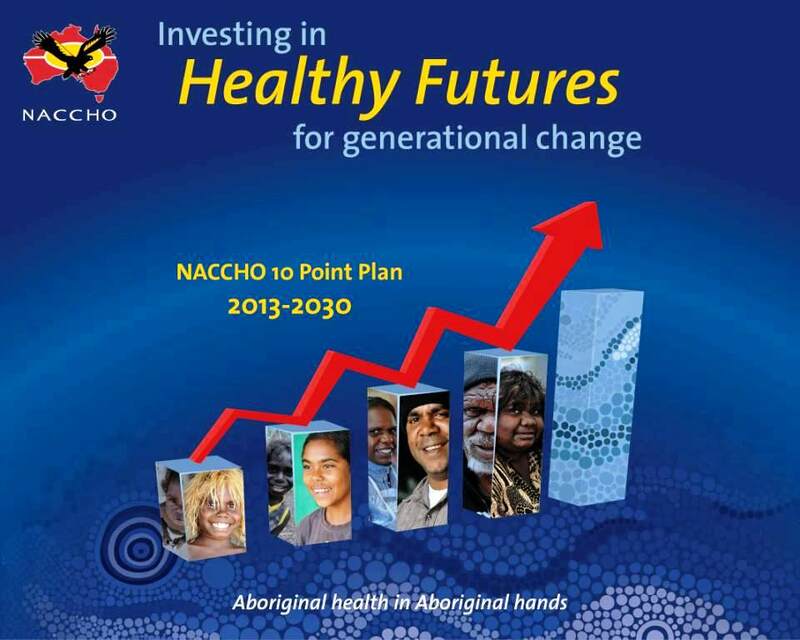 However, the Closing the Gap target to halve this gap in mortality rates by 2018 will be reached if current trends continue; between 2008 and 2010, Aboriginal and Torres Strait Islander children less than five years of age were hospitalised at a rate 1.4 times greater than other children of the same age [AIHW 2013]; Aboriginal and Torres Strait Islander children suffer from nutritional anaemia at 30 times the rate of other children [Bar-Zeev, et. al., 2013]; and Aboriginal and Torres Strait Islander children between 2 and 4 years of age are almost twice as likely to be overweight or obese compared with all Australian children in that age range [Webster et. al., 2013]. 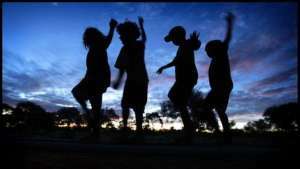 Aboriginal and Torres Strait Islander children were almost eight times as likely to be the subject of substantiated child abuse and neglect compared with other Australian children [AIHW 2012]. Is the only truly global diabetes event. 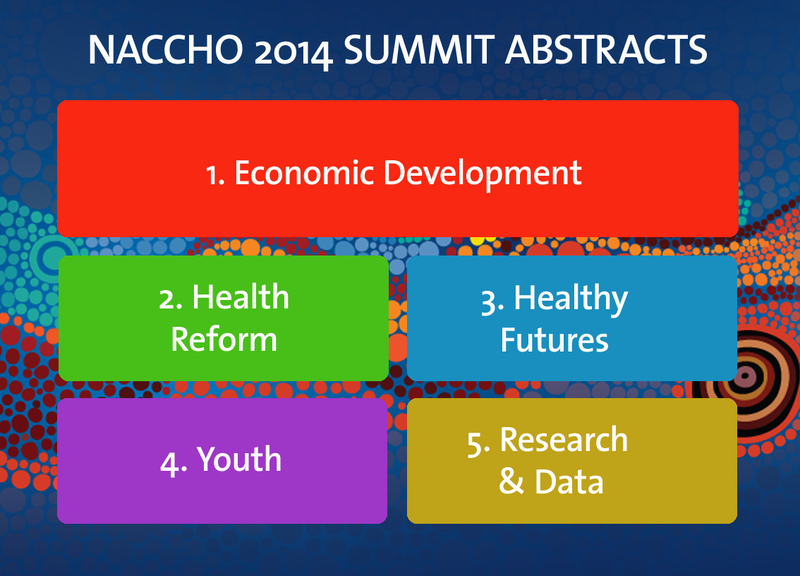 Join 12,000 healthcare professionals, policy-makers and advocates from all over the world. The deadline for the online registration is 16 November 2013. Register now! New! Online day rate now available for healthcare professionals residing in Australia. -A unique opportunity to network with over 400 speakers, 12,000 delegates and more than 200 IDF Member Associations from over 160 countries. -View over 1000 posters and choose from 275 hours of scientific sessions to learn about the latest advances in diabetes research, care and education. 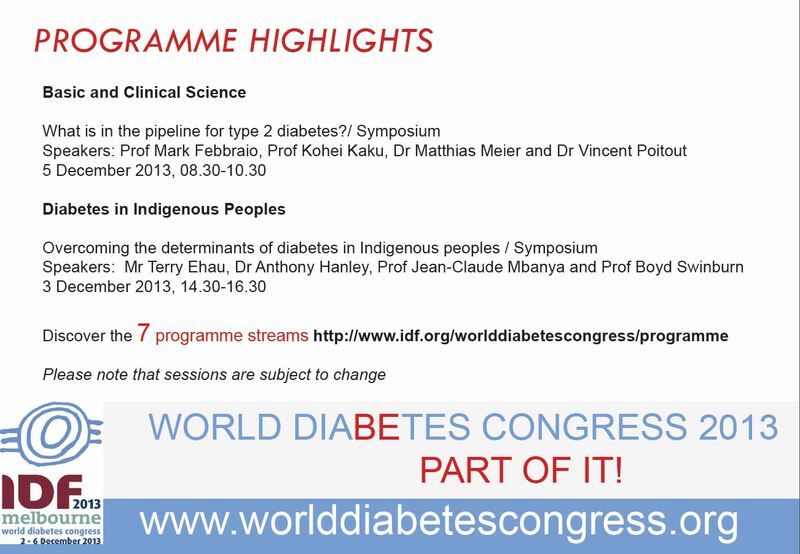 -Follow 7 distinct programme streams including the brand new “Diabetes Research in the 20th Century” and “Diabetes in Indigenous Peoples” streams”. With less than 25 days to go, the World Diabetes Congress is one of the world’s largest health-related events. It brings together healthcare professionals, diabetes associations, policy-makers and companies to share the latest findings in diabetes research and best practice. The scientific programme, divided into 7 themed streams, offers you 20 CME credits and 275 hours of sessions from some of the world’s top diabetes experts. The online day rate is now available for healthcare professionals residing in Australia. 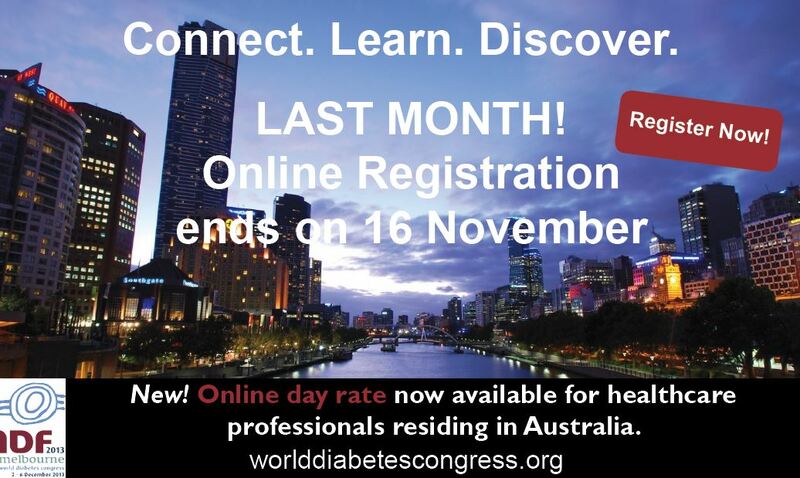 Join us and help shape the future of diabetes in Melbourne this December 2-6.